I was blessed to attend an interfaith vigil in solidarity for the victims of the New Zealand massacre. It was held at one of the mosques at which I regularly attend prayers. They originally had space set up for 500 people. The room was packed so full, that it was standing room only. 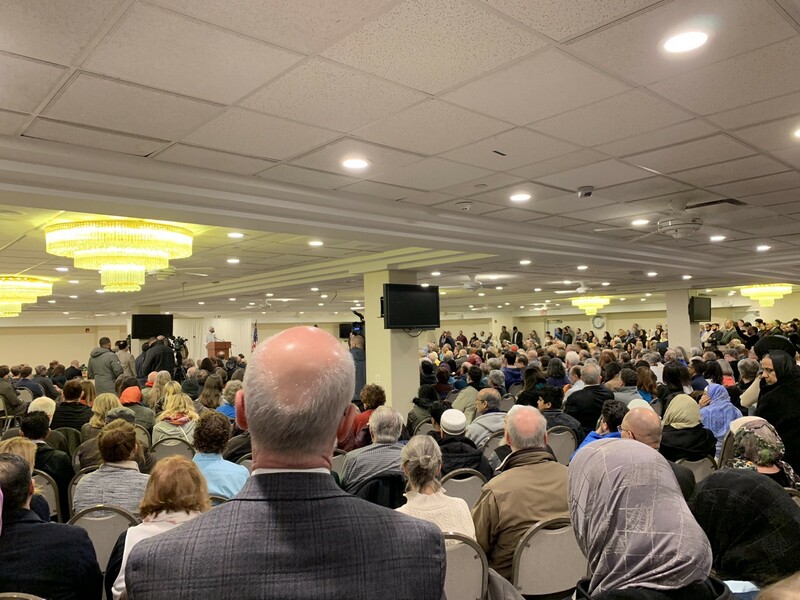 One by one, faith leaders, political leaders, and law enforcement eloquently spoke and expressed their love, their solidarity, their support, and spoke out against the horrible hatred that manifested itself in Christchurch. To see all these people, from all walks of life, come together and stand as one against hate, against an attack that we Muslims took so personally, was very overwhelming emotionally. The savage terrorist animal who committed the massacre in New Zealand explicitly said that one of his aims, by using a gun, is to tear the United States apart along racial and cultural lines. Judging by the overwhelming show of love, solidarity, and unity, it is clear that the terrorist failed. As it ended, the experience filled me with tremendous hope in humanity. Whenever dark events like these occur, whether it is perpetrated by a Muslim or not, it is very easy to become cynical and think that there is no hope left in humanity. It is very easy to retreat into our own corner, surrounded by that which is familiar, and look at the “other” with suspicion and fear. In fact, retreat into the corners of familiarity and allowing one to be consumed by fear is exactly what led to the hatred which took the lives of 50 innocent Muslim worshipers in New Zealand, and 11 innocent worshipers in Pittsburgh, and nine innocent worshipers in Charlotte. This must be resisted with every cell in our bodies. What gave me hope was seeing hundreds of people, from all walks of life, from all faith traditions, stand together as one people and cry out in one voice, “Hate will not win!” Indeed, the bonds of sisterhood and brotherhood are so much stronger than the fires of hatred that lead to terrorist violence, whether that violence be in Paris, or Tel Aviv, or Pittsburgh, or San Bernardino, or Christchurch, New Zealand. In his closing remarks, the organizer of the vigil hoped and prayed that this would be the last vigil of its kind, and he asked all of us to do what we can to make that dream a reality. I accept this challenge, and I will do whatever I can to speak out against hatred and incitement, whether it be from without the Muslim community or from within. Hate is hate, terror is terror, and it all must be confronted and condemned. If there is anything good that has come out of the horror in New Zealand, it is that so many people across so many faith communities have come together in peace, in love, in brotherhood, in sisterhood, and in unity. The bonds that they are forming and have formed will be needed going forward, as the struggle to resist hatred and bigotry will indeed be difficult. Yet, love will ultimately win out; love will always trump hate; love will always be victorious in the end. This is because God Himself is Love, and with God on our side, nothing will be able to stop us.